Top-down mandates concerning the curriculum of the school leave no room for program creativity and program commitment. Yet principals and teachers are held accountable for student achievement results. Constitutionally, powers not granted to the United States are reserved to the States or to the people. The book’s primary purposes center on the need for placing the responsibility for determining student curriculum and academic achievement the local school level whereby school personnel determine the individual student’s personal interests and needs and design a curricular program for each student that fosters personnel success. The creative abilities of teachers are inhibited in attempts to implement top-down mandates that set forth academic content and instructional methods set forth by federal and state agencies. If learning programs and instructional methods are to be designed to meet the individual interests and needs of the learner, who is in the best position to determine such needs? M. Scott Norton has served as a classroom teacher, coordinator of curriculum, associate superintendent and superintendent of schools. He served as professor and vice-chairman of the Department of Educational Administration at the University of Nebraska-Lincoln and chairman of the Department of Educational Administration and Policy Studies at Arizona State University where he is currently Professor Emeritus. 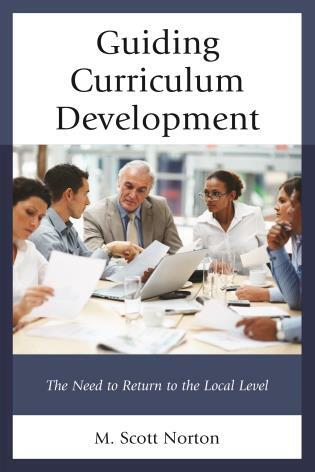 Chapter 5: The School Curriculum: Local, State or Federal? We believe that the social, mental, and physical needs of children and youth are determined best by local educational professionals. This book sets forth the foundations of practice that will serve these purposes.